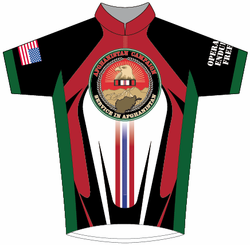 This Afghanistan Campaign OEF Cycling Jersey will make a wonderful gift or addition to your own wardrobe. This jersey is made of polyester euro-mesh microfiber with Airdry technology. This technology provides excellent moisture wicking in a light weight material with an antimicrobial finish that resists odors and reduces germs. This jersey has a 20� hidden zipper, three rear pockets, and elastic waist band. This jersey�s quality is guaranteed. The front of the jersey is pictured above. The back of the jersey is pictured at left. Click to enlarge photos. For sizing purposes, please note that this jersey runs about two sizes smaller than typical t-shirt sizes.